Comic strip star Jerry on the Job appeared in 1938 IGA ads for C. W. Post Grape Nuts Flakes. "Try that million-dollar flavor!" An animated George Burns and Gracie Allen appeared in 1938 IGA ads for C. W. Post Grape Nuts. George: "So Crisp, So Crunchy, So Nut Like". Gracie: "Yes George, and I'm Pretty Too". Burns and Allen "Say Grape Nuts Are Tops!" Grape Nuts animated Boxing Glove (circa 1955) showed up in ads with the slogan "Every Little Grape-Nut Packs a Wallop All It's Own!" Grape Nuts Mother and Boy (1955). The Amazin' Raisin Trio (1988) appeared on this very short-lived, but beautiful, cereal box. "Crunch, Crunch, and More Crunch". Consider this cereal a "Hugely Expensive Blunder". It didn't make it because the cereal was round, like bumpy Cheerios, and the raisins all sank to the bottom of the box, through the interstices between the cereal pieces. This was the second time Post attempted to market Amazin' Raisins. The first was in 1968. See our "Dead On Arrival" cereal page for more details. Post Tostems was Post's answer to Kellogg's Pop Tarts. One of our site visitors indicated that Sugar Spice Lion, Chocolate Elephant and Berry Bear were three animal characters connected with Toastems. Please contact me if you have images of these characters. Flion the Friendly Lion (2001) replaced Winky the Eagle who had been on boxes since 1997. Winky the Eagle (2001) appeared on boxes of Post CocoBalls which touted "chocolate fun shapes". Walt Disney's Jiminy Cricket, from the movie Pinocchio, with his signature "Traveler's" umbrella chirped the virtues of his circa 1982 cereal. The cereal was basically "fruity sweetened corn, oats, and wheat" large (red, orange, and yellow) puffed stars -- so large in fact that you were lucky to get three on a spoon with milk at a time. While this box features a yo-yo, a site visitor remembers digging out another neat cereal prize inside -- a nighttime sky "Stargazer" that rotated. It was one of four that you could collect, one for each season... Spring, Summer, Fall, and Winter. The impressive "Limited Edition" cereal box looks like it's filled with corn pops and marbits. 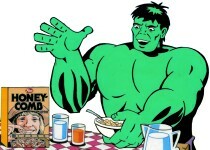 It was released as a tie-in to the Summer 2003 movie release of the HULK. The 4 marbits were in the shape of: green hulk, red brick, white-and-blue flask, and a yellow sun. Post released this limited edition Nickelodeon TV-related cereal entitled "The Fairly Odd Parents!" cereal in late 2003 / 2004. It's full of colored star shaped cereal pieces. 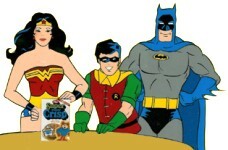 Batman, Robin, and Wonder Woman appeared in ads for Super Crisp. Justice League heroes appeared on Post cereal boxes in 2004 as follows: Alpha-Bits = The Flash, Marshmallow Alpha-Bits and Strawberry Blasted Honey-Comb = Batman, Honey-Comb and Oreo O's = Superman, Cocoa Pebbles = Wonder Woman, Golden Crisp = Green Lantern, and Waffle Crisp = Martian Manhunter. Hey, Post, what about Hawkgirl? Post gave Batman (based upon the animated series) his own limited edition cocoa-flavored Batman-signal-shaped cereal with white marshmallow bits. Batman trading cards were printed on the box back. Disclaimer: This is a non-commercial site with the sole purpose of assisting visitors in locating information on their favorite breakfast cereal characters. All of the names, characters, brands, and icons listed here are trademarks of Post or their respective parent companies and cannot be used for commercial purposes. Enjoy Post cereals and support your favorite characters!